Aluminium Roof Ventilators are developed with high grade aluminium based upon the latest technology. 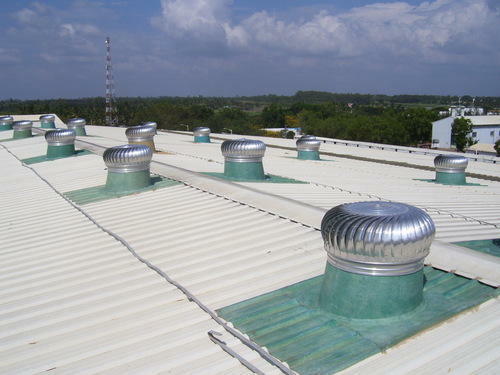 This Airier Roof ventilator is used for ventilation purpose and for keeping humidity and temperature at required level. Our developed Aluminium Roof ventilators are based on the latest technology and are effective in managing the temperature inside the industry and exchange air from inside to outside in automatic fashion. Established in the year 2016, Air Roof Ventilators is effectively occupied with wholesaling and trading of Roof Ventilators. We offer a wide and comprehensive range of products, which include Polycarbonate Ventilator Base Plate, Wind Turbine Ventilators, Turbo Ventilators and many more. Made up of the best quality material, ventilators are good options to be used for maintaining the temperature inside the industry or factory and keep it fresh. These ventilators are easy to install on the roof of the industry or factory and spin faster with wind power. Moreover, we offer these high-end quality ventilators in all the standard designs and sizes. Our customer-centric, as well as quality-focused business policies, have been enabled us to muster a large client-base in this competitive market.